"A masterpiece from start to finish"
Cincinnati Opera's production of Missy's Song from the Uproar named "Best Opera of 2017"
MISSY PROFILED IN FORBES: "This Musician is Dedicated to Gender Equality in her male-dominated field"
-Missy named one of the top 35 female composers by Anne Midgette of the Washington Post. Opera Philadelphia announces it will stream Missy Mazzoli's opera Breaking the Waves in its entirety on March 29th at 1pm. Slipped Disc calls it "the opera of the century". Performed by acclaimed chamber ensemble eighth blackbird. An excerpt from Missy's 2012 music theater work Song from the Uproar, based on the life and writings of Swiss adventurer Isabelle Eberhardt. Performed by mezzo-soprano Abigail Fischer and NOW Ensemble. 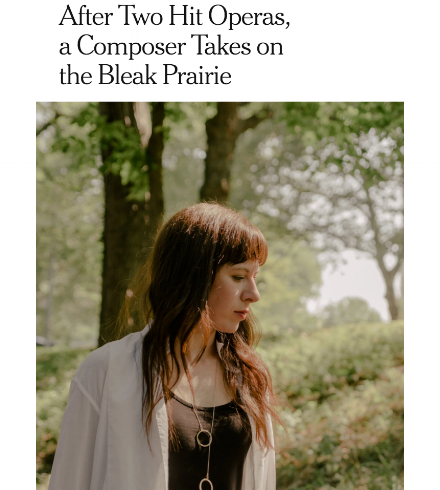 Performed by Jody Redhage, on cello and voice, and Missy Mazzoli on electronics.